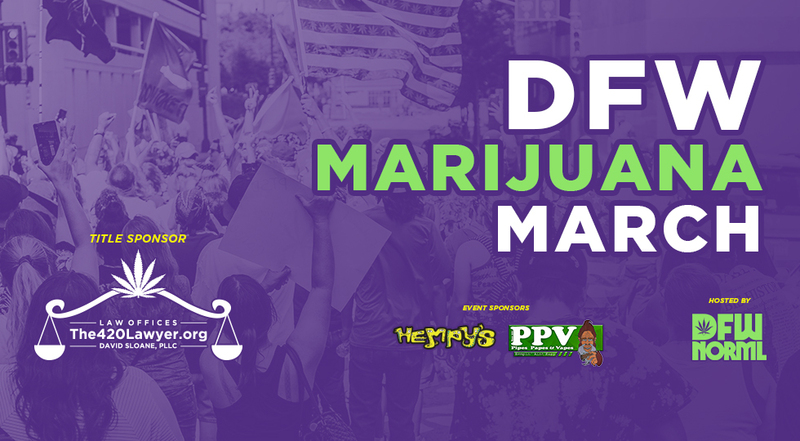 The DFW Marijuana March is a free-to-attend community event created to bring the topics of marijuana decriminalization, medical cannabis, industrial hemp, and recreational cannabis for responsible adult use to citizens of North Texas. Activities include informative and inspirational speakers, vendor booths selling legal smoking accessories, apparel, CBD, and other products, as well as prize giveaways, music, and an uplifting march through the streets of Fort Worth to the Tarrant County Courthouse. Hosted every year by the Dallas/Fort Worth chapter of the National Organization for the Reform of Marijuana Laws (DFW NORML), this event is made possible thanks to the respectful cooperation of the Fort Worth Police Department and the Fort Worth Office of Special Events. VENDOR BOOTHS AVAILABLE – Book yours today at https://dfwnorml.myshopify.com/products/dfw-marijuana-march-sponsorship-2019 – The cutoff to book a vendor booth for the DFW Marijuana March is May 1, 2019. Questions? Email eric@dfwnorml.org.